My last post invited you to reflect on what you want to be able to do in English, or in another foreign language that you are interested in. I insisted on getting down to the very specific ‘can-do’ goals that you would like to set yourselves: not just ‘I want to improve my English’, but, for example, ‘I want to be able to cope with management meetings in English’ and even further ‘ I want to be able to cope with interruptions during management meetings in English’. I’ll take myself again as an example, analysing possible learning goals for my German. First I need to decide on the main direction to go. Preliminary Question: (Language) Knowledge, or (communication) skills in German? I’m interested in both, but I’ll start with the skills. Question 1: What skills do I want to improve? 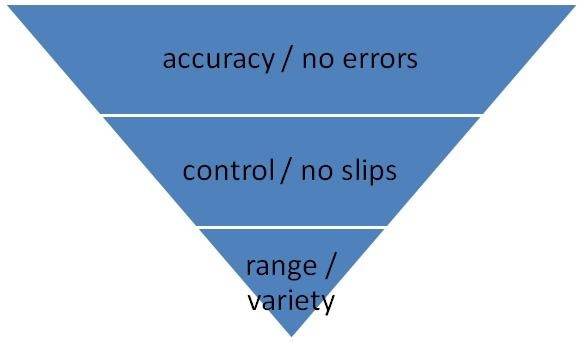 I’ll split SKILLS into elements that are important to me, and put them down in a triangle. The skill that I didn’t choose for my goals is Reading. Now I’ll take each of the three elements above and again split them into elements in a triangle. 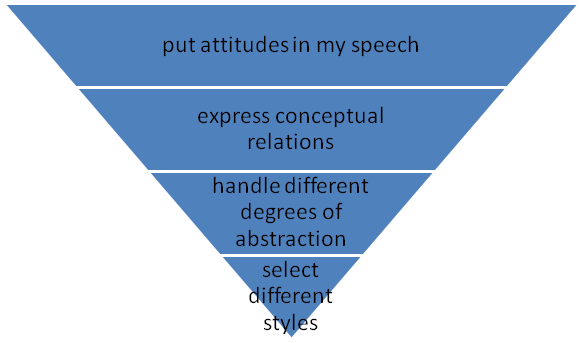 Below an example for SPEAKING. Question 2: What exactly do I want to improve about my Speaking? 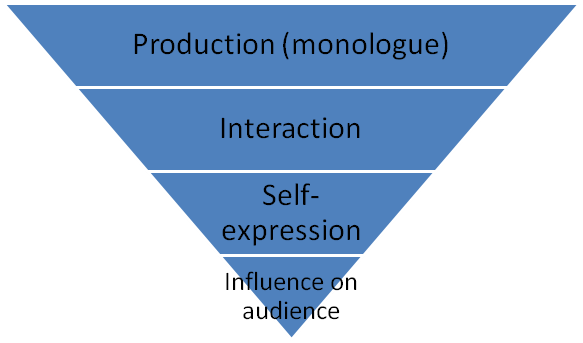 Question 3: What exactly do I want to improve about my speech production? Question 4: What exactly do I want to improve about my fluency? 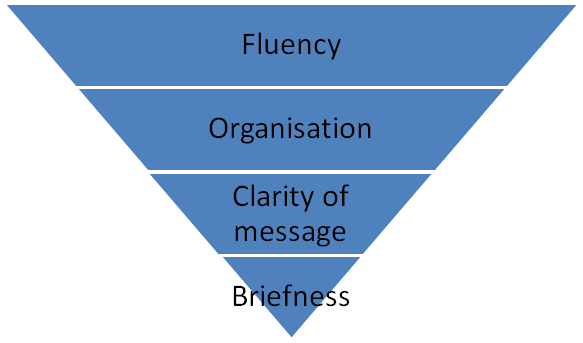 These items are so basic, that I realise immediately what I need to do about them: activate my language resources by speaking, speaking, speaking – preferably helped by a teacher. I’ll now get back to Speaking and detail another element, Self-expression. Question 3b: What exactly do I want to improve about my self-expression? Question 4b: What exactly do I want to improve about expressing conceptual relations? These items are again so basic, that I know where I need to search for them: materials for advanced / academic language, economic or academic journals etc. I’ll just get back now to the Preliminary Question, and take the other direction, language knowledge. Question 1: What exactly do I want to improve about my language knowledge? Question 2: What exactly do I want to improve about my range? So I need to work through vocabulary materials, and possibly focus on exercises that make me reformulate ideas in alternative ways. Variety of words for same meaning – see the example above for duties. 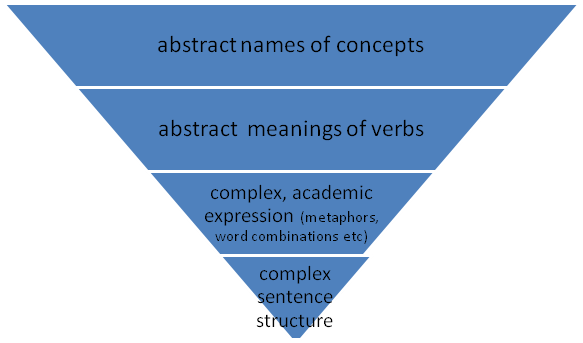 Variety of sentence structures for same message – see the example above for advice. you can write key words in the triangles (as I have done), or you can write short statements that clarify your meaning; if you don’t have any experience with language learning you may not be able to find a key word that names an ability so easily. The important thing here is that you note down your own idea, in no matter what form. You can write as many elements in the triangle as you feel is necessary; triangles are not preset, they can have 2, 3, 4 or 10 layers. 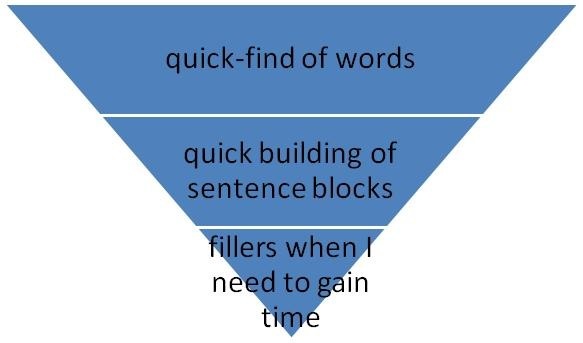 You can use the position of the triangle (bottom up) to prioritise the elements; for example, if you are most interested in learning a variety of sentence structures for same message, write it at the top. Look at the very last results, on the very last level under each category. These are the real, specific goals you care about. Put them down on a list so you don’t lose sight of them. Report them to the teacher that you hire to guide you. Look at your answers to the top levels: the preliminary question and questions 1 and possibly 2. They will indicate what strategy should work best if you start to learn in that direction. In my example, I am mostly interested in Speaking and not at all in Reading, but I also give a lot of importance to language knowledge, in particular to range and control. This means that I could use a book and do self-study for the language part, but I should in parallel use every opportunity to speak in real life to consolidate the language I learned on my own. ‘Control’ is a matter of long practice, so if I want to improve control I don’t need to buy books or sign up for a course. Making a subscription to a German magazine or journal wouldn’t help me directly, as I am not interested in reading skills, but it would help me indirectly if I used the reading as a way to examine language in an authentic text. I don’t necessarily need a private teacher, as I can improve my German by studying alone or by reading and by speaking in everyday life.